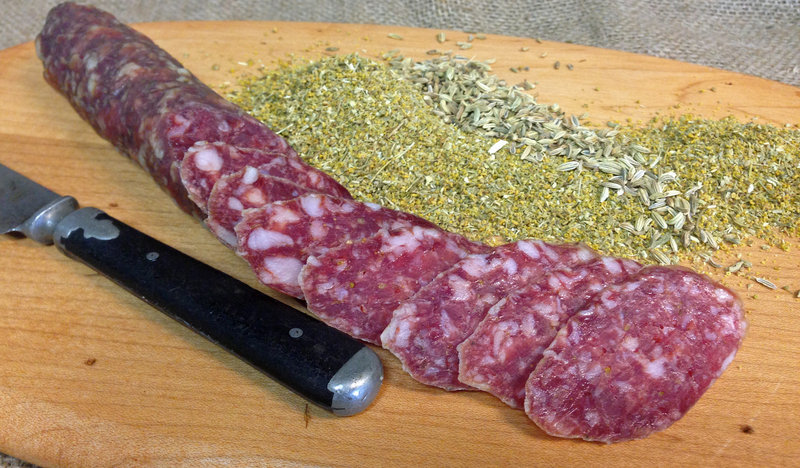 We make dozens of charcuterie items, and some of our customer’s favorites are below, with links to our new web store. We also produce a number of other specialties on a rotating basis; pâtés, terrines, confit, and rillettes. Just fill out the form below, and we’ll email a current list of stock on hand. We ship by USPS, and UPS daily. Sub Rosa Finocchiona is rich and mild, celebrating the superior quality of our heritage breed pork, and the delicacy of our curing process. We mix a generous handful of precious Italian fennel pollen into each batch, with crisp white wine, garlic, and touch of white pepper. 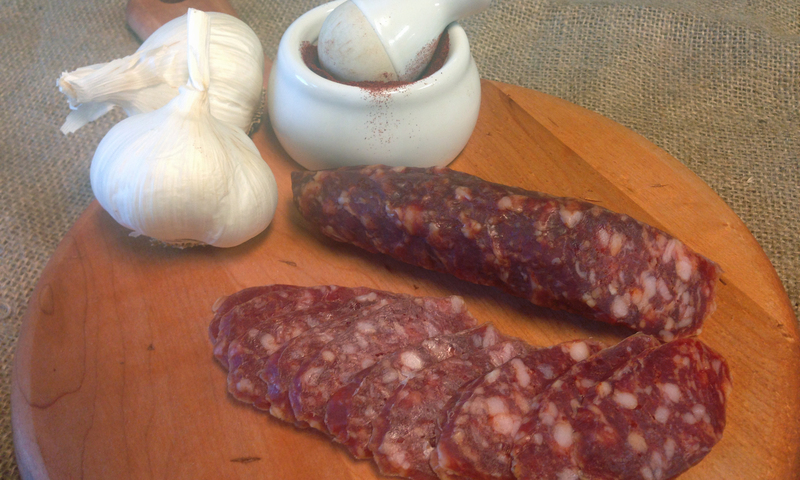 Sub Rosa Sopressata strikes a three-point balance between piquancy, acidity and richness. Sweet-hot Calabrian chiles, bold red wine, organic garlic, and select spices create our version of this Southern-Italian classic. The flavors and aromas are unmuddled, simple, and elegant. Fermentation and drying are carefully controlled to bring out the pure flavor of our heritage breed pork, and the lively flavor of Southern Italy’s extraordinary chiles. 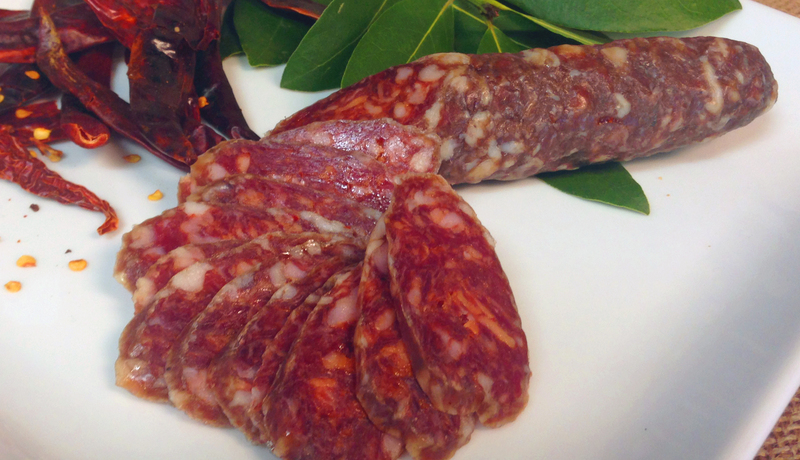 Sub Rosa Chorizo Espanol is a Spanish-style dry salami, which gets its rich brick-red color and smoky/spicy edge from precious Spanish Pimentón de la Vera. We gild the lily with nut-brown Oloroso sherry, Valencia orange zest, and organic garlic. 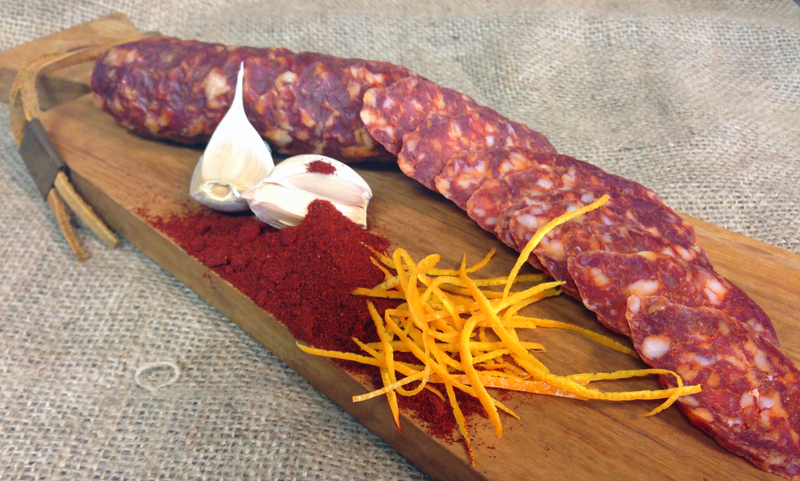 Our chorizo is hand-pressed and hand tied, fermented in the traditional way, smoked gently over cherry wood, and aged to perfection. Fuet means “whip” in the Catalan language, so named for the long, thin traditional form. 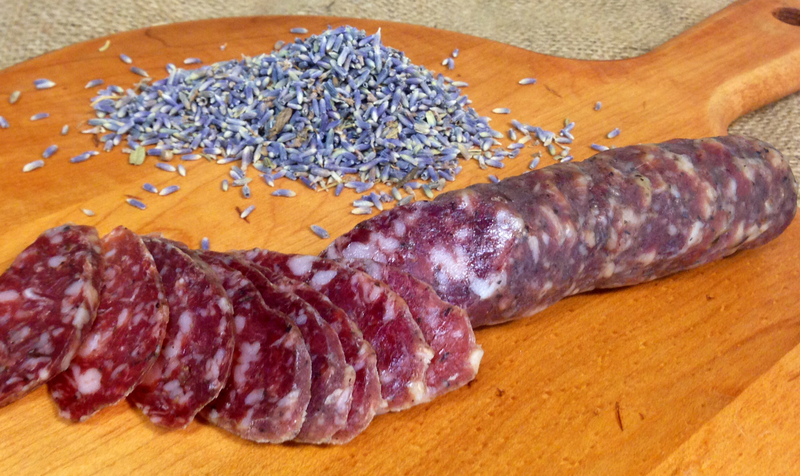 This is a purist’s cured sausage if there ever was one. Mild but complex, fuet can be served simply sliced on a board, or makes a delicious addition to soups, stews, and sandwiches. Sub Rosa Fuet is flavored only with sweet dried peppers (pimentón dulce), white wine, garlic and pepper, allowing the pure flavor of well-cured pork to shine through. Our duck rillettes starts with whole legs of Sonoma County’s legendary duck, cured with salt and spices, then cooked long and slow in clarified duck fat. The tender meat is hand shredded and seasoned with herbs, cracked pepper, and whole grain mustard. Our rillettes is potted with a protective layer of fat, which may either be stirred in or skimmed away before serving. pounds of cured meat from each shoulder. Ours is dry cured for 18 days, rinsed with Chianti, and spiced lightly, before spending just forty five minutes in our smokehouse over cherry wood. It is a decidedly nontraditional take on an Italian classic, and never fails to make our customers swoon. Like prosciutto, coppa should be served freshly sliced. If you own a slicer, you can purchase our coppa whole by filling out a contact form below, or try it on one of our salumi boards, available for pickup here at the shop. Bresaola is air-cured beef. We start with a perfectly trimmed eye of round. It is first cold-cured with salt for 3 weeks, then bathed in bold wine, spiced with pepper, coriander and a pinch of toasted fennel seed, and hung to dry in our chamber for a minimum of sixty days. The basic method is similar to prosciutto, coppa, and other whole muscle salumi, but the lean flavor intensity and mouth feel is an elegant counterpoint to a cured meat board dominated by pork products. Like prosciutto, coppa should be served freshly sliced. If you own a slicer, you can purchase our bresaola whole by filling out a contact form below, or try it on one of our salumi boards, available for pickup here at the shop.